Just as spacesuits help astronauts survive in inhospitable environments, newly developed "spacesuits" for bacteria allow them to survive in environments that would otherwise kill them. University of California, Berkeley, chemists developed the protective suits to extend the bacteria's lifespan in a unique system that pairs live bacteria with light-absorbing semiconductors in order to capture carbon dioxide and convert it into chemicals that can be used by industry or, someday, in space colonies. "We are using our biohybrid to fix CO2 to make fuels, pharmaceuticals and chemicals, and also nitrogen fixation to make fertilizer," said Peidong Yang, the S. K. and Angela Chan Distinguished Chair in Energy in UC Berkeley's Department of Chemistry. "If Matt Damon wants to grow potatoes on Mars, he needs fertilizer." Yang, a faculty scientist at Lawrence Berkeley National Laboratory and a co-director of the Kavli Energy Nanoscience Institute, was referring to the actor who played the protagonist in the movie The Martian. Damon's character was marooned on Mars and had to use his own waste as fertilizer to grow potatoes for food. The research, funded by NASA through UC Berkeley's Center for the Utilization of Biological Engineering in Space, will be posted online this week in advance of publication in the journal Proceedings of the National Academy of Sciences. "We are interfacing these bugs with a semiconductor that overwhelms them with electrons, so they can do more chemistry," Yang said. "But at the same time this process also generates all these reactive oxygen species, which are detrimental to the bugs. We are putting these bacteria in a shell so that if any of these oxidative species comes in, this first defense, the shell, decomposes them." "We picked these anaerobic bacteria because their selectivity toward one chemical product is always 100 percent," he said. "In our case, we picked a bug that gives us acetate. But you could select another bug to give you methane or alcohol." While Yang's first experiments with the hybrid system paired bacteria with a bristle of silicon nanowires, in 2016 he discovered that feeding the bacteria cadmium encouraged them to decorate themselves with a natural semiconductor, cadmium sulfide, that acts as an efficient light absorber feeding the bacteria electrons. In the current experiment, the researchers took bacteria decorated with cadmium sulfide and enshrouded them with a flexible, one nanometer thick layer of MOF. While a rigid MOF interfered with the bacteria's normal process of growth and splitting, a zirconium-based MOF patch turned out to be soft enough to allow the bacteria to swell and divide while still clothed with MOF, after which new MOF in the solution re-clothed them. "You can think of the 2D MOF like a sheet of graphene: a one-layer-thick cloak that covers the bacteria," said co-author Omar Yaghi, a pioneer of MOFs and the James and Neeltje Tretter Chair in the Department of Chemistry. 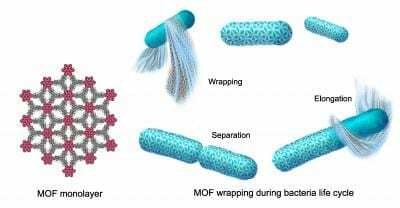 "The 2D MOF is floating in solution with the bacteria, and as the bacteria replicate they are covered further with the 2D MOF layer, so it protects the bacteria from oxygen." Yang and his colleagues are also working to improve the hybrid system's efficiency of light capture, electron transfer and production of specific compounds. They envision combining these optimized capabilities with new metabolic pathways in these bacteria to produce ever more complex molecules. "Once you fix or activate CO2 – and that is the most difficult part – you can use many existing chemical and biological approaches to upgrade them to fuels, pharmaceuticals and commodity chemicals," he said.